My creative side that embraces unique and different just couldn't appreciate the effort. 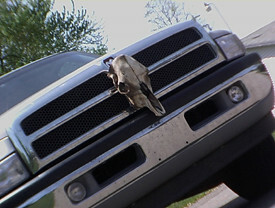 Maybe it's the contradiction of cow skull and Ram truck logo. A ram skull would be cool... but a cow skull is just gross. (I took this photo in Mendon, which is a lot like Mad Max's post apocolyptic wasteland depicted in the movie).